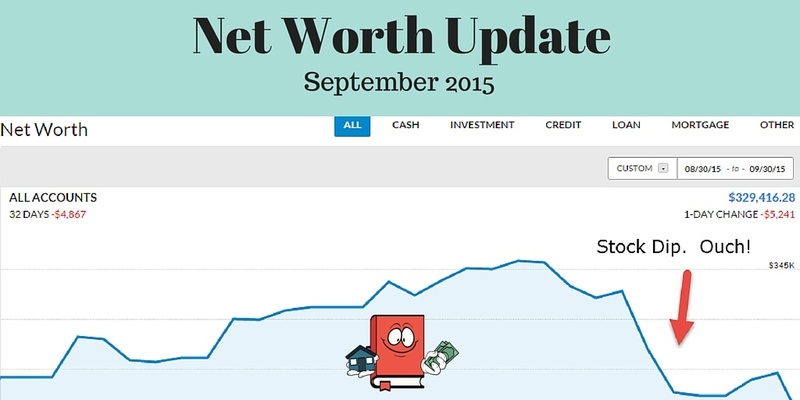 This is my official September 2015 Net Worth Update. 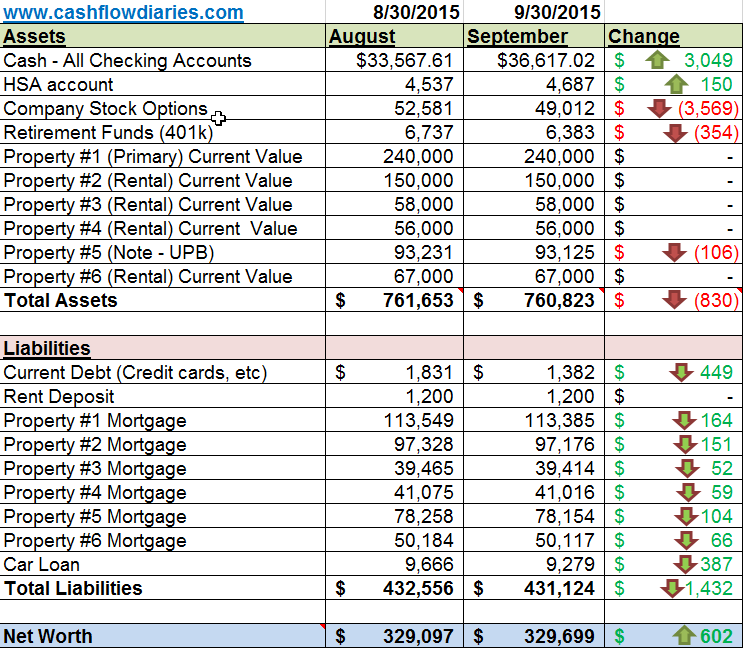 Below are my actual numbers for ALL my investments and liabilities as of 9/30/2015. Explanations and quick summary below chart. If you would like to see my previous months net worth posts, please visit my Net Worth Tracker. Wow! I just barely made it a positive month. September was crazy with my stock. If I would have calculated my net worth mid-month I would be up about 15k. They took a drastic hit last week and it put a nice dent in my net worth as you will see in the Personal Capital chart below. Darn these stocks! Oh well! Not a huge deal, I’m still positive and my cash position is still increasing which is very important to me because the cash is what I am using to buy my real estate properties. I did go on another vacation in September and ended up buying a new dryer so I still feel that I spent more money then I usually do. My cash position should have been slightly higher but that is just way life works you know?! Speaking of real estate properties, I am now about half way through the process of purchasing a new turnkey rental property in Kansas City. If all continues to go well, I will have my new rental added to next month’s October net worth update. Stay tuned for updates on that. This constitutes two different checking accounts. My normal checking account and my REI (Real Estate Investing) checking account. This is now my 5th month posting my net worth and my cash continues to go up. Not as much as I would like but I take a lot of vacations and don’t hold back on spending typically which is a problem for me. If I really put the effort into cutting back costs especially entertainment and travel, then my cash would grow much faster. The thing is I really like to enjoy life and it keeps me super happy to do this. Maybe if I just dial it back a bit then I can have the best of both worlds. To spend or not to spend!! Ha! Anyhow, I will be dropping a 25% down payment on a new rental property here in October if it continues going the way it is so that will bring down my cash quite a bit. When that happens, the cycle starts again, save, save, save, buy property! Satisfied! These are stock options from my day job. I am fully vested. This is now the 2nd month in a row these went down. The worst part about it is that it was way up mid month. 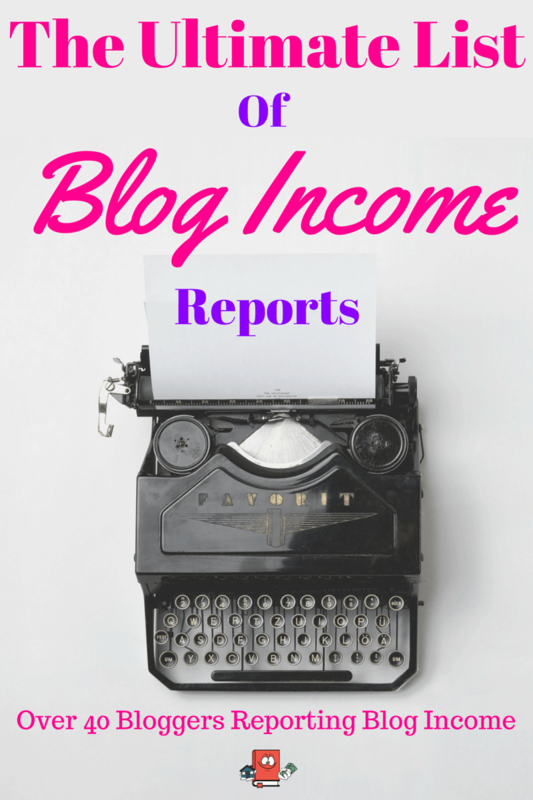 Last week it took a turn for the worse and it makes a significant impact on my net worth. It has started going back up today so we’ll see where it ends up at the end of the month. At the end of the day though I am not planning on selling this stock and just holding it for the long haul so whether it goes up or down it is not affecting my life. It is pretty much only affecting my net worth updates. Not Really Satisfied but i’m okay with it! This is my first rental property. It used to be my primary residence. I expect gradual appreciation from this property as well because it is in the suburbs of this HOT market I live in. Love me some HOT markets! 150K is about what its worth now based on MLS comparisons. I will update the market value of this property in early 2016. Rent paid in full and on time once again. This is my favorite tenant. The tenant pays on the first every single month, rarely calls me with issues and is keeping the house in great condition. I really love the cash flow on this one too. Super Satisfied! This is my first turnkey rental property I purchased out-of-state. I do not expect much appreciation on this property. I purchased this for CASH FLOW purposes only. Rent paid on time. No repair or issues reported this past month. Tenants are happy, my PM is happy and I’m happy. Very Satisfied! This my 2nd turnkey rental property. I do not expect much appreciation on this property. I purchased this for CASH FLOW purposes only. Rent paid on time. There have been some issues with the Property Management on this one this past month but it has not affected my property. Apparently the main PM got fired and the owner hired a new one. Like I said, it hasn’t made any impact on me but we’ll see how it goes. As long as nothing bad happens, I will continue using this PM but if it starts heading south, I will change PM’s in a heart beat. I already have another great Property Management team that I work with in this same city (Indianapolis) so I have a plan if I need it. Satisfied! This is my most recent turnkey rental property, I purchased it in early June and I absolutely love this house. I do not expect much appreciation on this property. I purchased this for CASH FLOW purposes only. I got September rent paid on time. No repairs or issues. Satisfied! I really do love this chart, it looks great and its nice and big. As you can see the month started low and worked its way up thousands of dollars only to take a big fat dip towards the end. Ouch!! Not much you can do about the roller coaster stock market right now, even with the dip I’ll take the positive month! Indeed! A positive month is a win in my book! I do think though that the stock price will go back up eventually which will be nice. Thanks for commenting Brian! Question for you, you only list your vehicle in the liabilities section, not the asset. I am assuming you are not underwater on your vehicle, so why do you not consider equity in your vehicle towards your net worth as you do with other physical assets such as properties? I am 35 and own multiple investment properties not unlike yourself, as well as vehicles free and clear and I would include the value of those vehicles towards my net worth. Just curious! Thanks for stopping by! Yeah I get this question a lot. Its really more of a personal preference for me. Since the vehicle is a depreciating asset and it will one day be zero, I would rather just not have it show up at all on my net worth. I do see many others though that do include the car and many that don’t. Its a coin toss I guess. I love this and thanks for sharing it with the world. I’m going to start doing this myself now. One thing I noticed is that you do not have an IRA account. This should be a no-brainer. You can contribute $5500 every year and even self-direct it into your real estate investments. 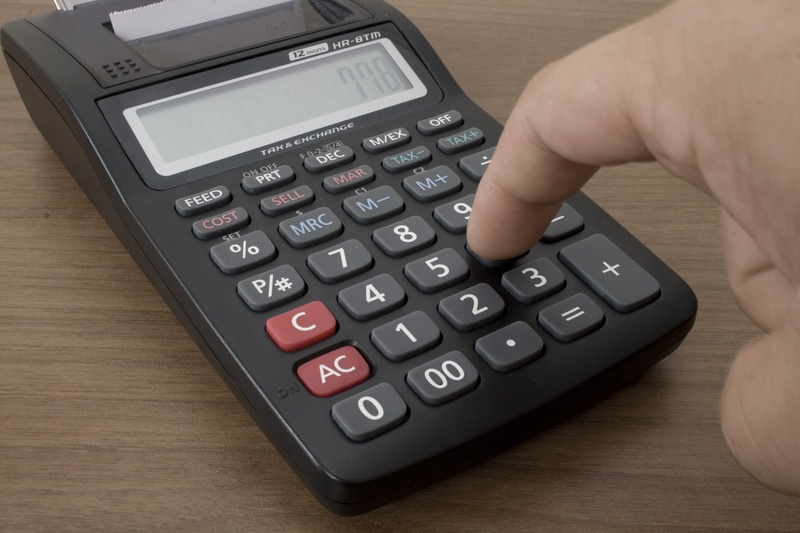 You can also choose between a Roth (taxed now) or a regular IRA (taxed later) account. I haven’t done this myself and someone showed me how crazy I was NOT doing this. Ralph I have been thinking about that IRA account for awhile now. You are absolutely correct, it is a no brainer and I should be doing it. Thanks for giving me the push I need to get this going, I just need to find a good person to set this up and give me more info on it because truthfully, I do not know much about how it works, what the returns are, rules/fees or anything like that. I love reading your net worth updates! I’m not quite where you are but it’s inspiring to see how you build up assets over time. 🙂 thanks for sharing! Thanks so much Jaymee! I really appreciate it. I find it very intriguing see how other people manage and build their assets. Its motivational too! Wow I didn’t realize you own so many properties – very nice. What part of the country are they located in? I wish property was that affordable in the San Francisco Bay Area – prices are crazy here but Manhattan still beats us by far. I took a hit in the stock market too. I hope the markets will stabilize soon! Oh yeah Im all about the rental properties! 😉 This is going to be how I become financially independent. I could only imagine how high the RE prices are out there in the the bay area. Its insane! I live in Austin, TX and the prices here are high but nothing compared to out west. P.S I want to know that are stocks a great source to earn money or not? Since you are doing that. Do tell me. Hi Kabir! You know to be honest, I prefer to invest in real estate. I am not well versed in stocks to be able to make money off of them. I can sympathize with you. I recently updated my own net worth on my site and noticed I took a big hit due to the stock market decline. Of course I will keep on buying investments as I normally do with the hope that it will pay off in the long run. I am impressed with your real estate portfolio. Real estate is something I am looking to get into as soon as my wife graduates school next year. In the mean time I joined a real estate mentor group to learn the ins and outs of real estate investing. Can’t wait to get that going! Thanks Michael. I have been reading a bunch of other people’s net worths and youre right! We are not the only ones that got hit. At the end of the day it really doesnt matter if we are just going to hold on to it. Im sure it will go back up eventually. Thanks for being impressed with my RE portfolio. I think you would be making a wise decision add RE as an additional investment class to your current investments. That is really cool you joined that mentor group, you can really network off of those types of groups which is important for real estate. Our balance sheets could not look more different, but I would love to diversify into more real estate. My balance sheet is Roth/403b/457b/investment accounts and my primary house. 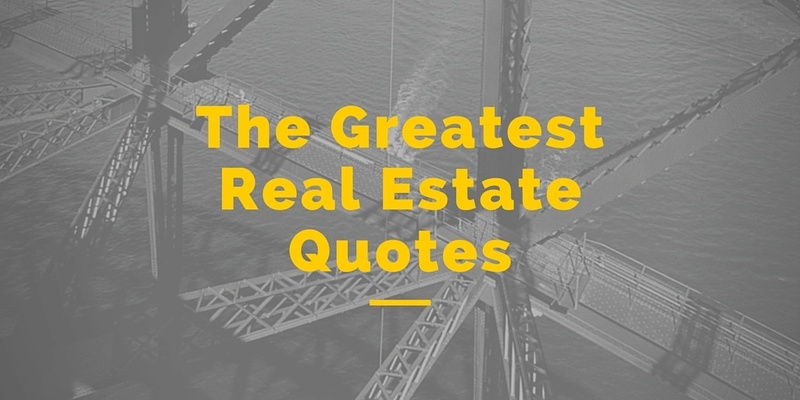 I need to go back and read your posts on the rental properties! You know I have been thinking hard lately as well about diversifying my balance sheet and I really need to at least get a ROTH going or something. At the end of the day, I think that for everyone, its best to have multiple asset classes going and to build a diversified portfolio. I just find it hard to get out of real estate because of the returns I have been making! Feel free to reach out if you ever have any questions or need advice on rental properties. You love your vacations right haha..
Keep up the great work on the blog, investing, etc!